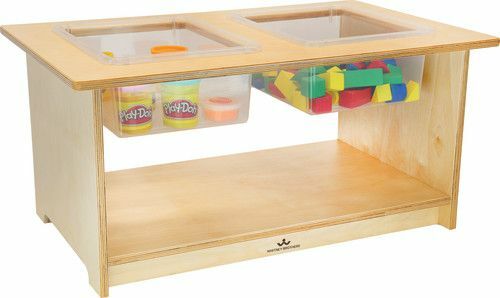 Sensory play for toddlers! 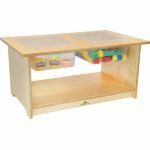 Our Sensory Table features sturdy construction and a table surface that's just the right height to engage toddlers. The table is designed with two clear, surface mounted removable plastic trays with lids [10.5"L x 13"W x 5"D] that hold sensory materials for little hands to explore and learn. 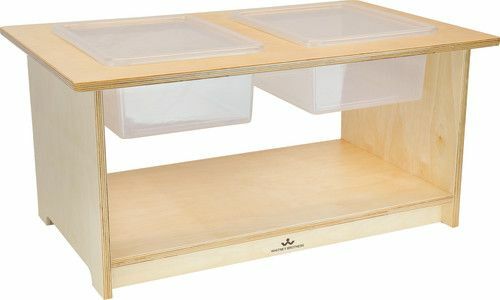 There's plenty of room for storage underneath, including one open fixed shelf on the cabinet bottom that accommodates extra bins [sold separately] and makes clean-up a snap. All edges and corners are rounded over and sanded smooth for safety. Floor glides included. 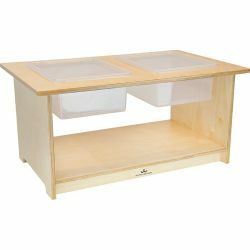 Constructed in beautiful, durable birch plywood with no visible screws or joinery for a nice finished furniture look. Need a different size? 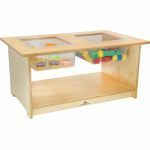 Check out our WB1775 Deluxe Mobile Sensory Table with Trays and Lids for preschoolers, sold separately.